A business school level interview is very different from your run-of-the-mill job screening. Business school interviews are drawn out events that can involve three or more interviews & meetings in multiple cities with up to a six of your peers and interviewers. Companies at this level are paying well into six figures, and they want to make sure you have the skills they want and are a great fit for their company culture. Strangely, very little is covered at top business schools as to how to dress for business school interviews. As a former student I was always surprised to see people spending 100K on their education yet wearing cheap suits and scuffed shoes to an interview. People make a judgment about you within 3 seconds; they then spend the rest of the time rationalizing this quick assessment. In other words it is very difficult to overcome a bad first impression. So why shoot yourself in the foot when with a little bit of planning and investment you can turn your appearance into an asset. Behind every successful business school interview is time spent in preparation. 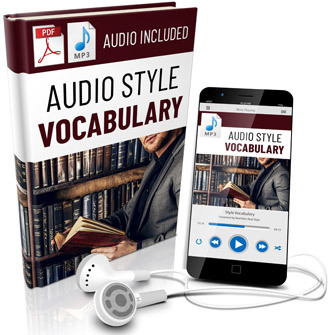 Study the company you are going to interview with and pay attention to their unstated dress code. Most likely you have met a few of their employees; how did they present themselves? Were they conservative or relaxed in the appearance? Interviewing with Citibank is different than interviewing with Google’s marketing department; both will require a suit, but with Google it’s safe to say you can wear a less conservative color and maybe throw in a white pocket square. The good news for the business school student is that the classical men’s suit style has remained the same for a hundred years. The bad news is that there are a lot of fashion suits out there that become dated faster than you can purchase them. The key here is to ignore fleeting fashion and rather seek understand what your timeless style is. This may sound complicated but it’s not. Just remember three things when choosing a men’s suit – Fabric, Style, and Fit. When selecting a fabric for an business school interview suit, take into consideration the fabric’s weave and overall construction. 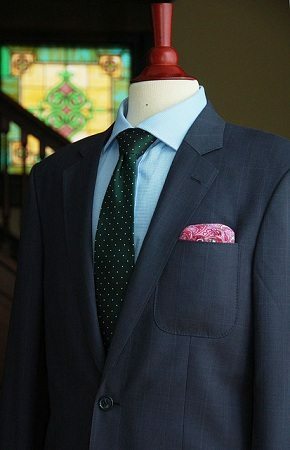 Try to go with a natural suit fabric such as worsted wool. A blend is acceptable, but make sure it’s of high quality and there isn’t a reflective quality to the fabric – although blends keep the price down they usually do not last as long and have a tendency to breathe less. As to color choice, the most common and therefore safest selections are navy blue, charcoal, and black. Although you can move outside these three if this is not a first or second suit with a pattern (navy blue pin stripes, bird’s eye, or a medium gray fabric are all excellent selections), make sure you understand your attire will stick out. When it comes to men’s suit style, go with a classical cut. In the United States this is a single breasted, notched lapel, 2 or 3 button jacket with a single or double back vent and regular flap pockets. Ensure you have at least as many cuff buttons as you have front jacket buttons (4 buttons on the sleeve is normal) and ensure you have a left breast pocket. Take a close look at the lapels: a trend right now is thin lapels; avoid this fashion fad as that you want to wear this suit in a year (and 5 years from now for that matter). With your trousers, depending on your build you want either flat or pleated fronts. If you are taller than six feet, consider going with a cuffed bottom. Finally, inspect the jacket and trousers for quality construction by tugging on the buttons, inspect the sewing, pulling on the seams. Most men’s suits are too large in one area or another. Try to find a brand whose factory cut matches your build and then find a tailor who can ensure your attire fits properly. For a perfect fit you want your suit jacket’s sleeves (when standing) to show 1 inch of cuff, its lapels should lay flat, an “X” from tightness doesn’t appear when buttoned, make sure the jacket’s shoulders do not extend past yours, that jacket covers your backside but isn’t so long you can’t grab it with your hands when standing straight, and finally make sure that no bunches form in the back near your neck collar (which should lay flat and show ¾ inch of shirt collar). 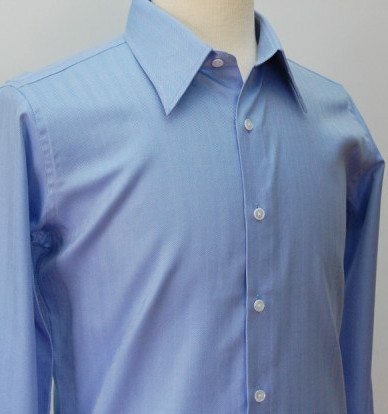 Dress shirts come in a wide variety of colors and weaves, and their effect on an outfit should not be underestimated. A pink striped herringbone dress shirt can turn an ordinary charcoal men’s suit into an outfit that demands attention while a conservative white broadcloth dress shirt can tone down a striped suit’s allure. 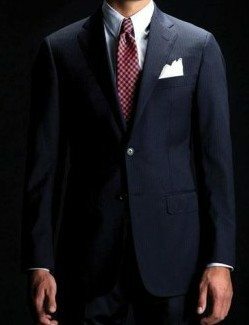 Choosing a unique fabric weave (such as a twill or herringbone) in a conservative color is a great way to retain your individuality while not making to much noise with your clothing ensemble. Conservatively colored patterned shirts are another way to break the mold without offending. Although they lower the formability of the outfit, a patterned shirt with a conservative tie is a safe bet on a second or third interview. Two parts of your shirt will be showing when you wear a jacket; the collar and cuffs. The collar should be chosen based off of your facial structure. Men with long, thin faces should go with a spread while round faced men should look to even out their face with point collars. Normal barrel cuffs with one or two buttons are fine for all interviews; you may be tempted to wear cufflinks to your interview with an investment bank, but be careful. Some interviewers view this display of cuff jewelry as obnoxious; however, if you normally wear this type of cuffs by all mean be yourself. As to fit, you should be able to put two fingers in-between your neck and a buttoned collar. Your sleeves and cuffs should extend to the top of your hands, and you want to show approximately 1 inch of shirt cuff from under your jacket sleeve. 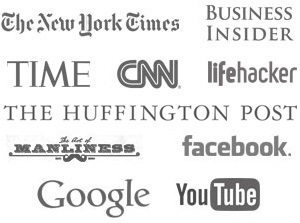 A conservative selection here is the best bet for the business school interview necktie. Red, gold, blue….the color is less important that the fact that it should just complement the outfit. You can stand out of the crowd by choosing a tie with a simple repeating pattern, but again try to keep it subtle. Striped ties are a good choice, but be aware as to whether it is a regimental tie or not. In countries such as England, memberships to certain military clubs are symbolized by striped tie design; you do not want to find yourself in a situation having to explain why you are wearing another man’s regimental colors. Unless you are going to be eating (where it serves to hold the tie in place), there is no reason to use a tie clip or tie pin in an business school interview. And it should go without saying that anything with hula girls, Santa Claus, or reflective colors that can be seen at night should be avoided. For business school interviews we recommend a plain black Oxford. They feature round toes, sometimes with a cap and either closed or open lacing. 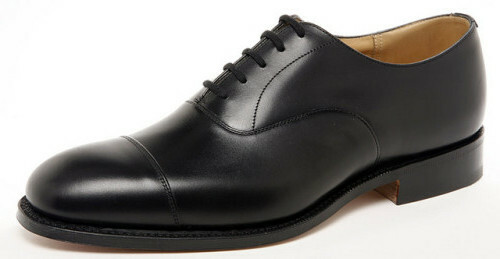 Plain cap-toe Oxfords are the most formal option for business wear, and can do double-duty as formal shoes. Oxfords with broguing along the cap’s edge, or trimming the uppers, are still formal enough for a business school interview in the United States. Avoid slip-ons, whether they are loafers, boots, or monkstraps. Although these are perfectly fine for a business casual luncheon (and are great for travel! ), in a formal interview you are best advised to wear a timeless pair of classic Oxfords. 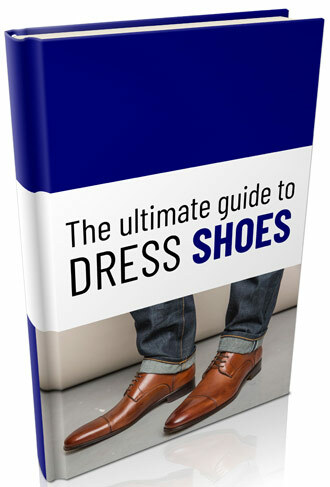 For a detailed overview of men’s dress shoes – click here. Yes, I just know you were waiting for me to cover this topic. While not terribly exciting, your socks are a detail that should not be overlooked. They should match your slacks or shoes and be preferably dark in color. The goal is to not draw attention; if the socks are seen, they should appear to flow seamlessly between the shoes and trousers. Also make sure they are high enough that you do not expose your bare legs when adjusting in your chair. 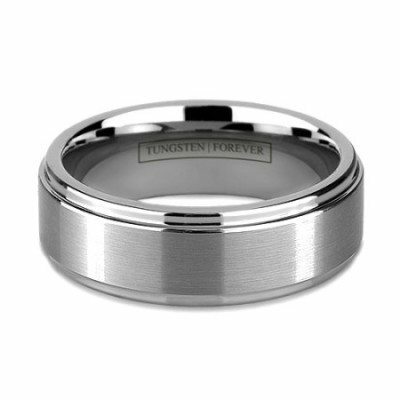 Wedding rings are always acceptable in an business school interview; however anything else is fair game and is left up to the interviewer’s personal views on this matter. A class ring from Annapolis or Texas A&M may give you a leg up if your interviewer is an Alumni or you’re in Houston, Texas. But it just as easily could stereotype you if the person interviewing has a chip on their shoulder. Nose rings, eye piercings, and earrings are making their way into the corporate scene, but each of these adornments still send a message to the interviewer. Be yourself, but be aware that you cannot wear these pieces of jewelry without it affecting a person’s impression of you. As for watches in an interview, keep it simple. No alarm should be set or active (leave digital at the gym), and it should not scream I have 25K on my wrist (leave the diamond studded Rolex at home). Ensure your interview watch fits and doesn’t slide around like a bracelet. A simple watchpiece with a leather band is my personal favorite, but in the US a metallic band is just as acceptable. Get a haircut a few days before your business school interview and go to someone who has been cutting your hair for a while; a bad haircut isn’t something you want to worry about. Even if you don’t need a haircut get at least a trim around the neck and ears. Invest in a nail brush and thoroughly clean your nails (no grime underneath); they should be cut neatly as well. Finally, avoid cologne; a shower, deodorant, and a neutral smelling aftershave lotion are all you need; anything else is could be overwhelming to the senses in a small closed room.